Keeping up with multiple tools to manage data that resides anywhere, from virtual machines to the cloud, can be taxing on time and resources. In the past, vendors have tried to address this need with limited success, but recently there has been a shift in the market. Converged data protection is one of many new approaches that successfully integrate data protection and management in one system. 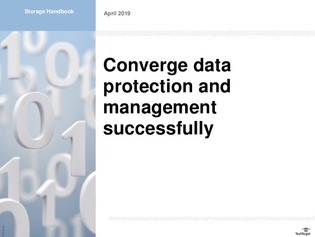 This guidebook offers expert advice on evaluating converged data protection solutions, with consideration given to the value and risk of integrating data protection and management and what vendors have to offer. For assistance with assessing your company’s options, read the guidebook here.